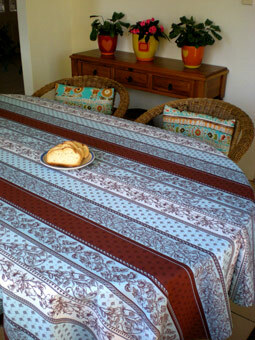 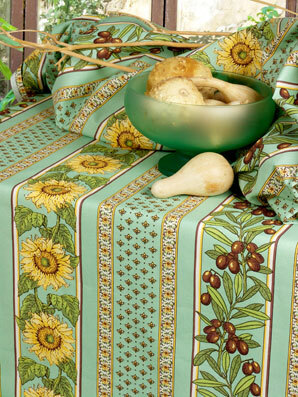 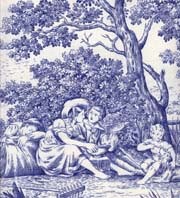 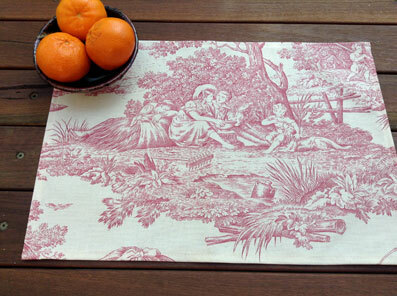 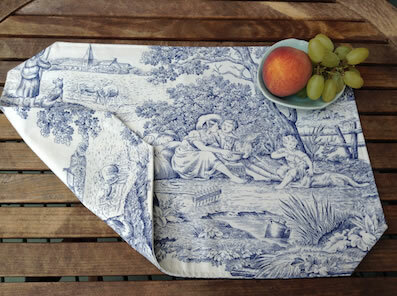 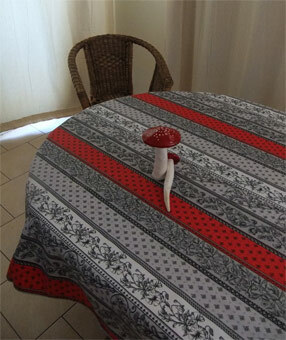 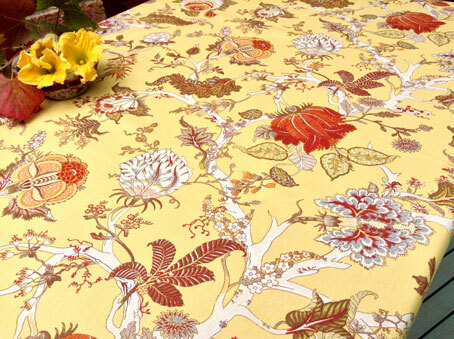 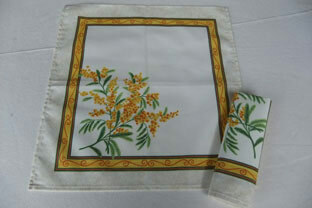 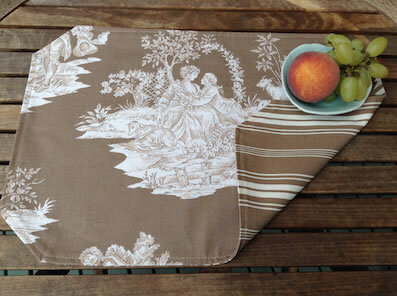 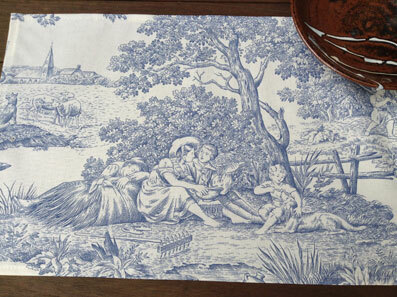 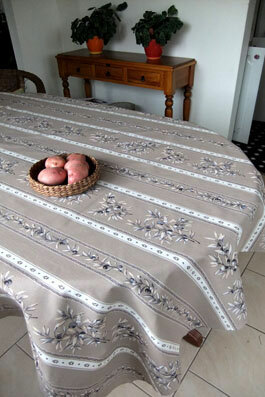 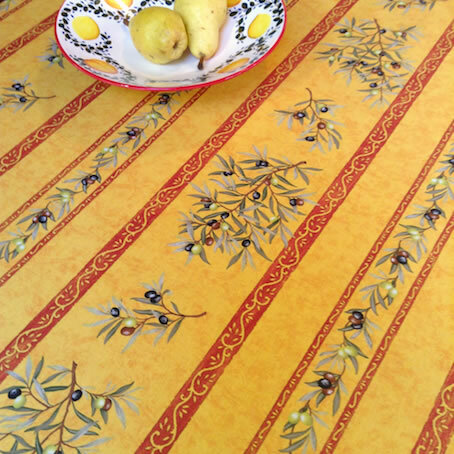 A French Provincial cotton tablecloth brings all the charm and tradition of Provençal living in your home. 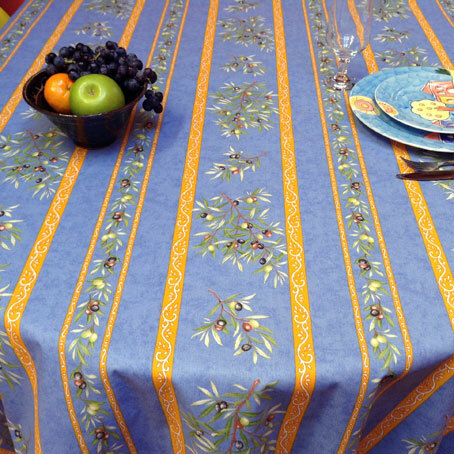 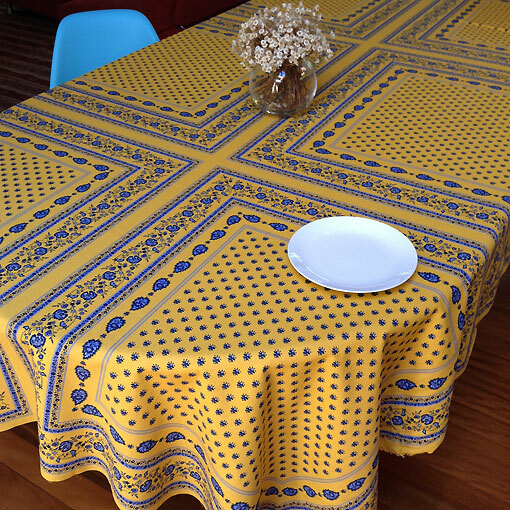 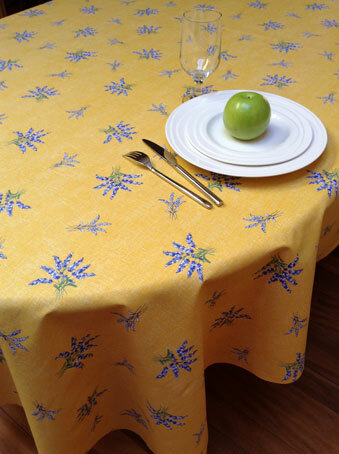 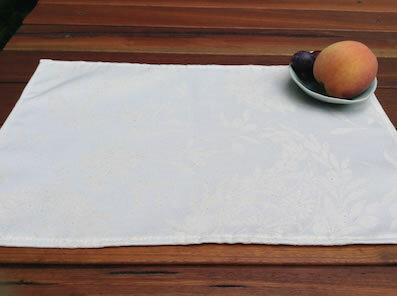 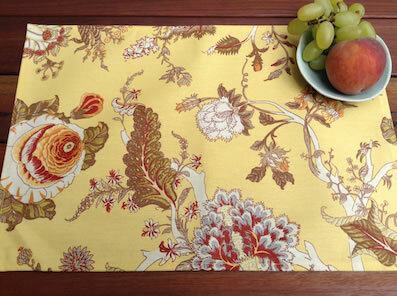 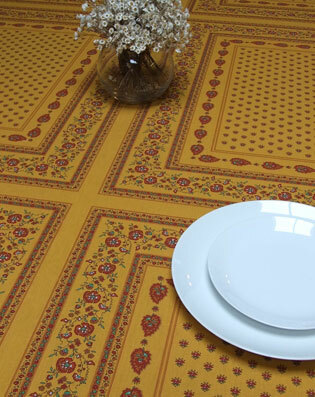 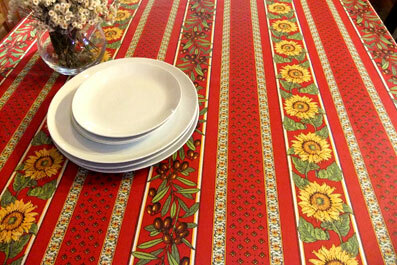 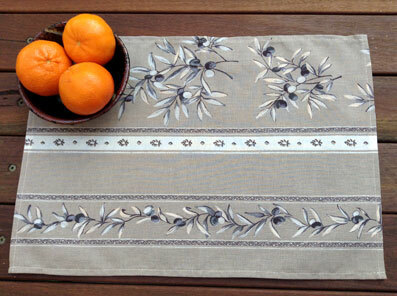 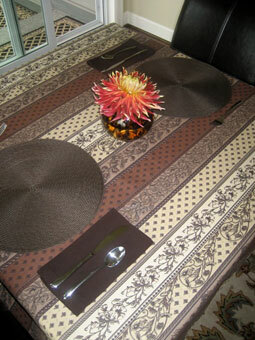 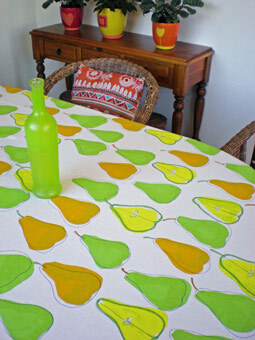 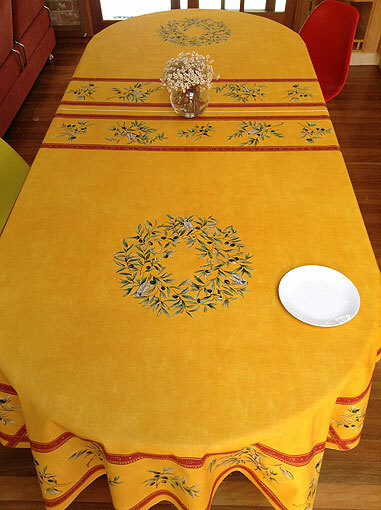 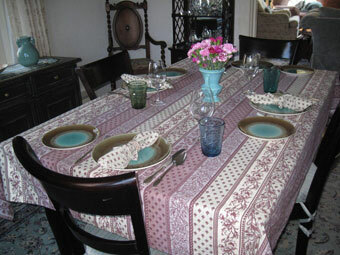 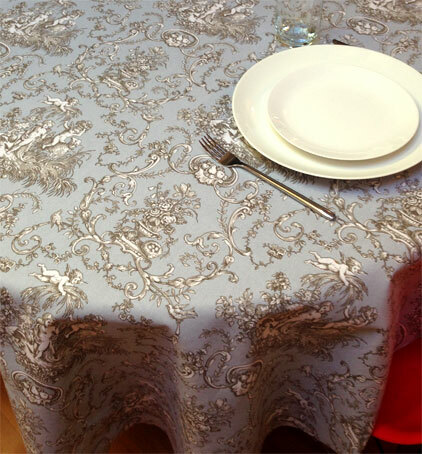 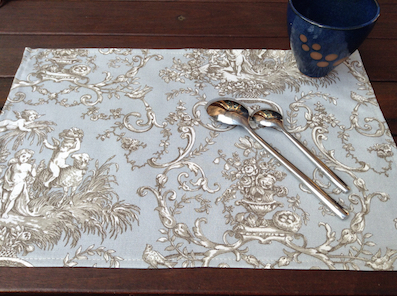 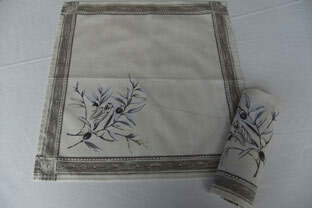 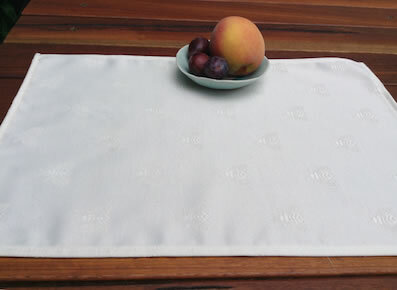 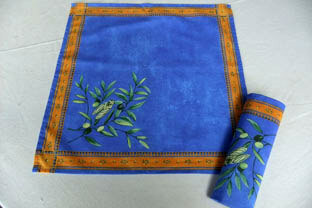 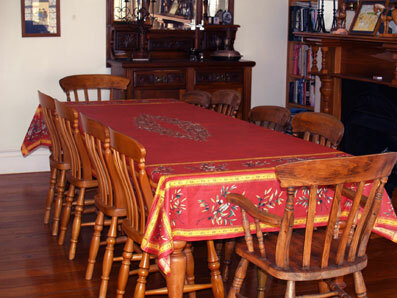 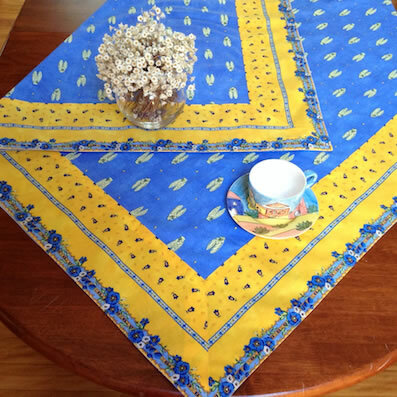 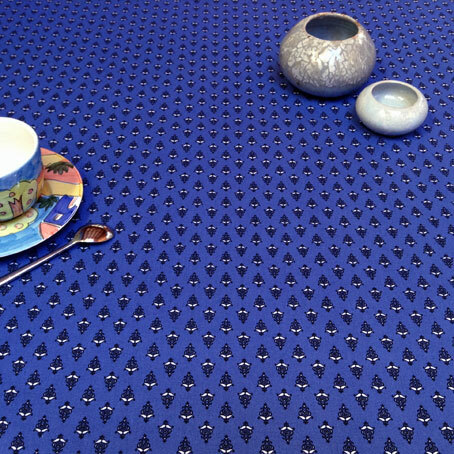 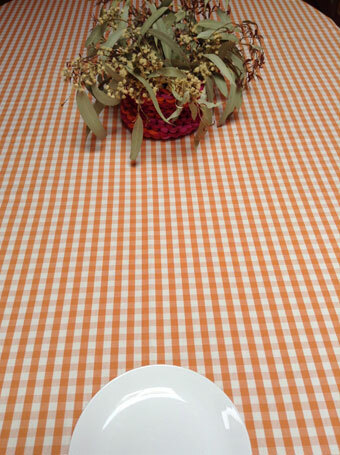 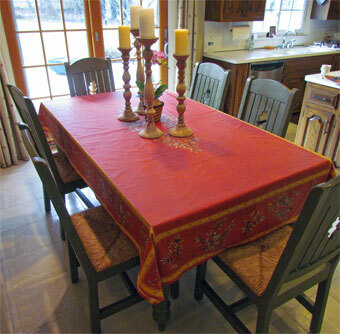 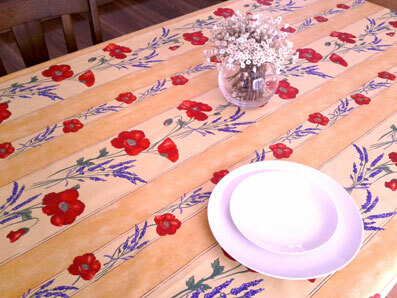 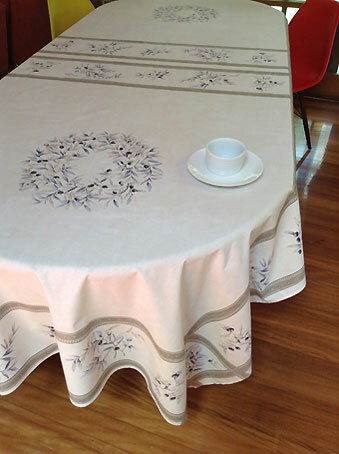 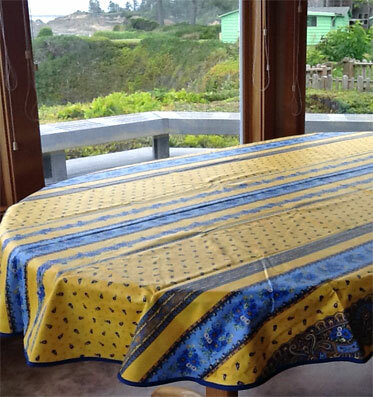 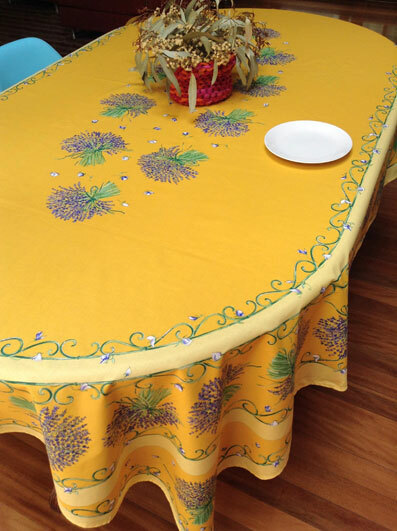 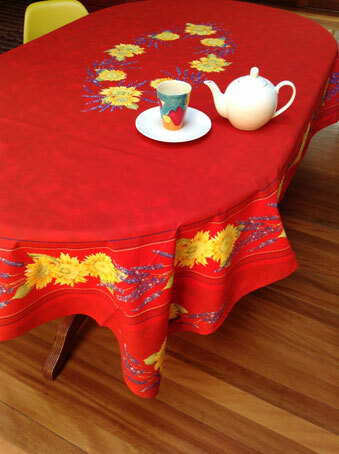 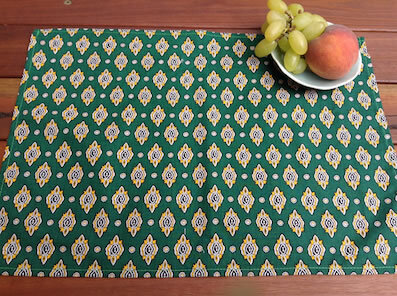 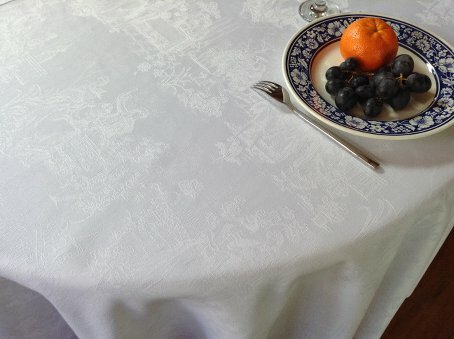 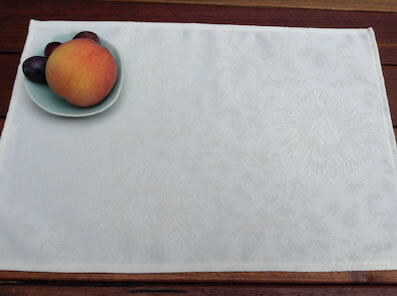 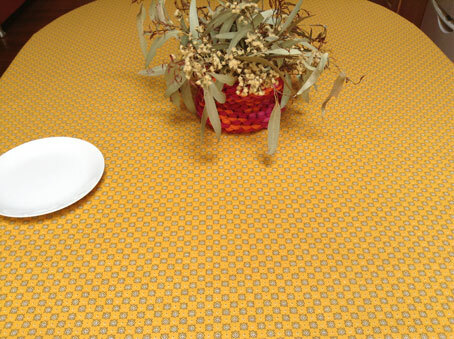 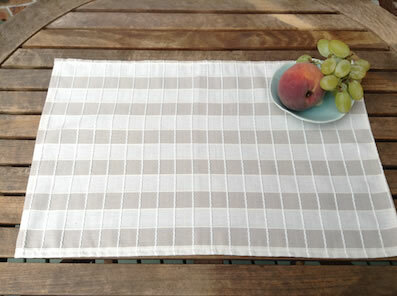 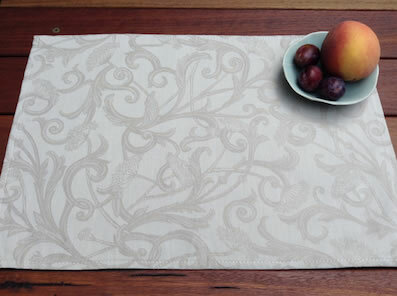 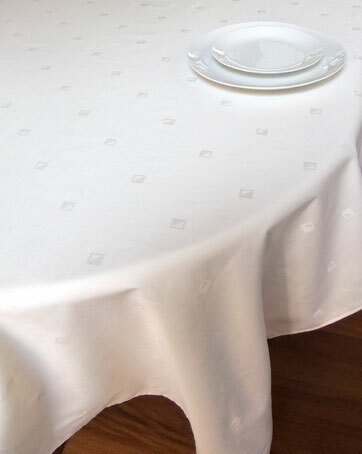 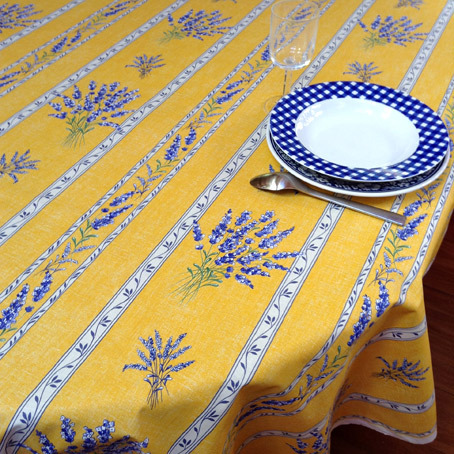 If the above tablecloth sizes do not suit your table, email the dimensions of your table top. 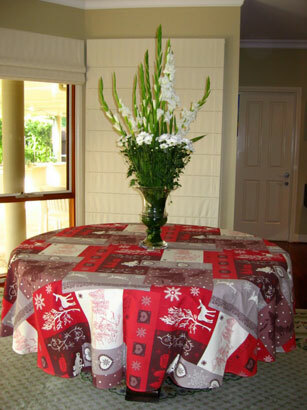 We custom make tablecloths at no extra cost. 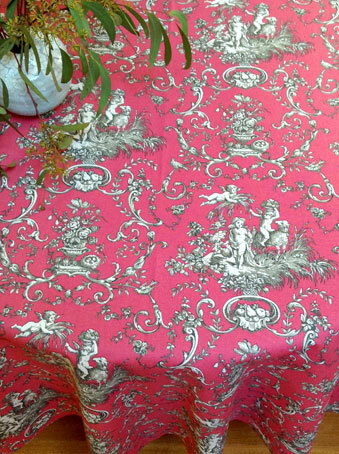 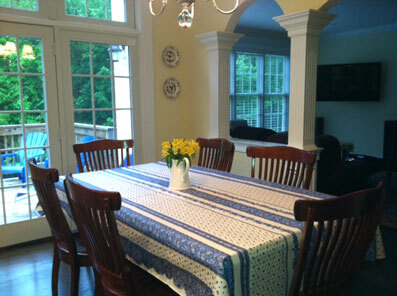 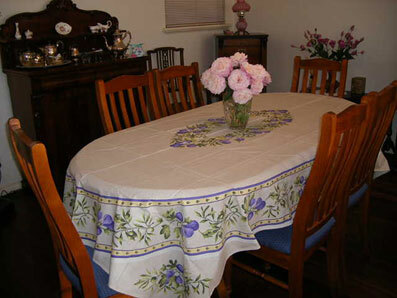 Bastide Lavande 60" square tablecloth with full border in Mary's room (St Louis, Missouri). 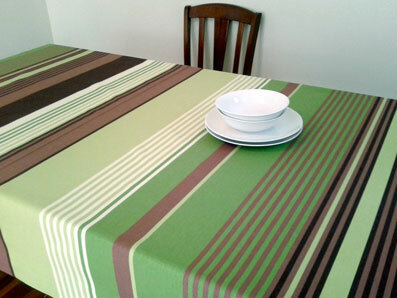 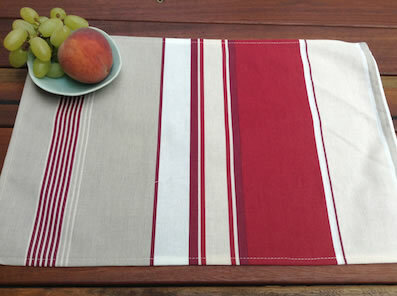 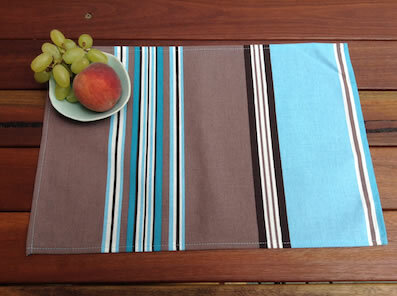 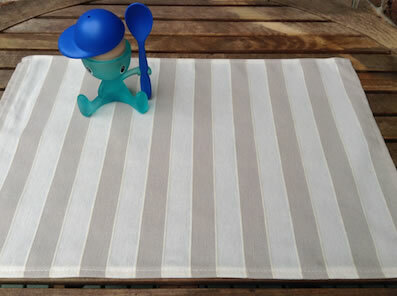 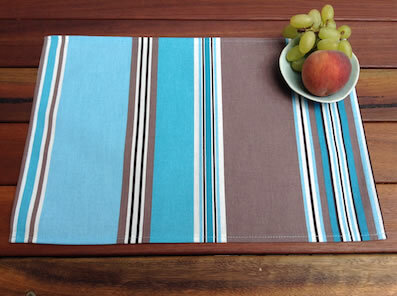 This striped pattern is suitable for any size cloth. 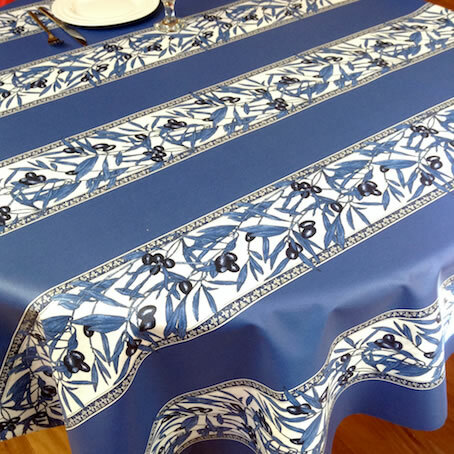 For outdoor and patio tables with an umbrella, we can make you cloth "umbrella friendly" by adding a central hole and an open-end zipper. 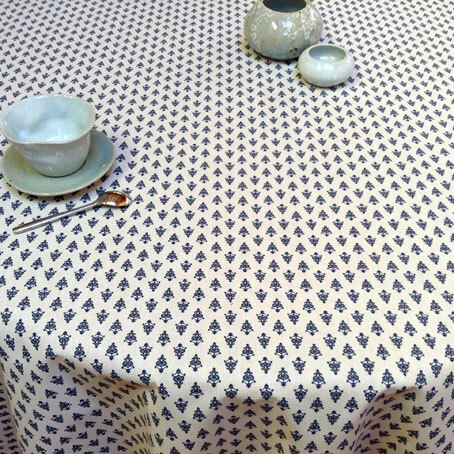 This fabric is not a true blue/white. 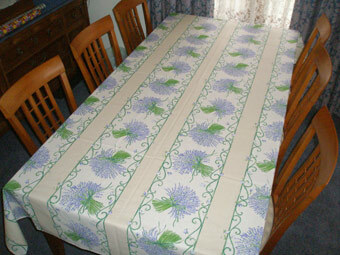 It has light green and purple shades. 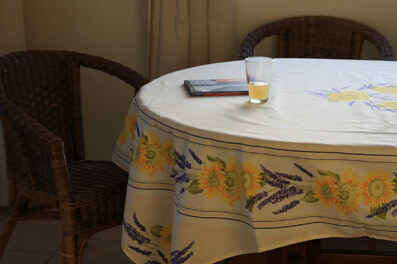 Do you have a patio table with an umbrella ? 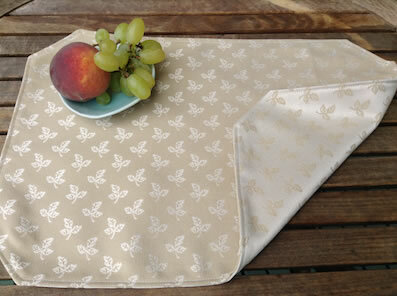 a central hole and open-end zipper to your cloth. 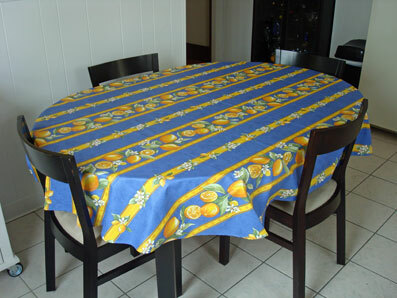 It is only an additional $22 on top of the cost of the cloth. 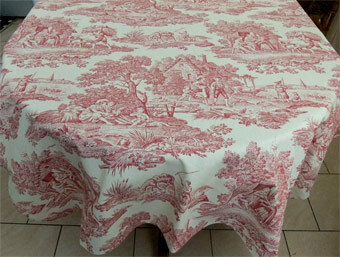 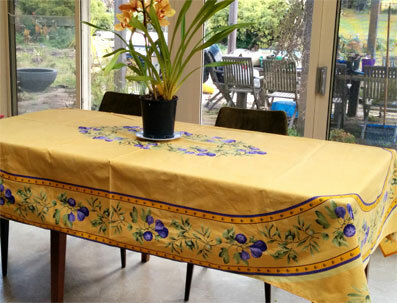 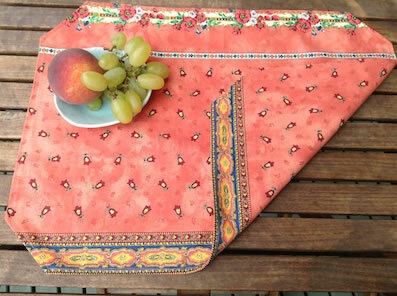 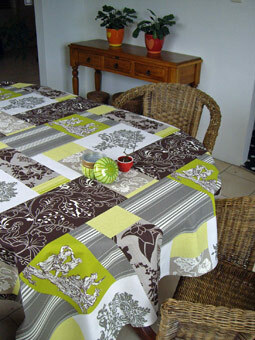 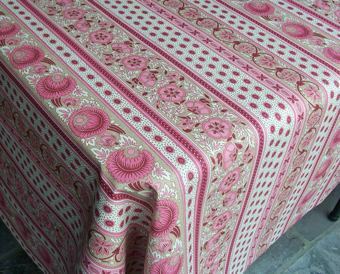 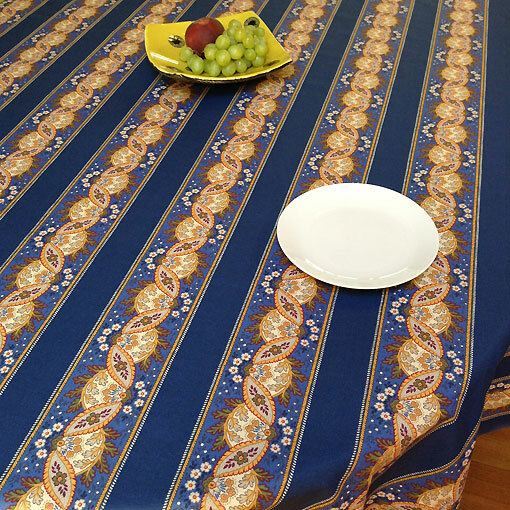 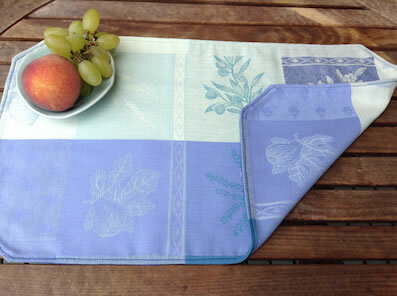 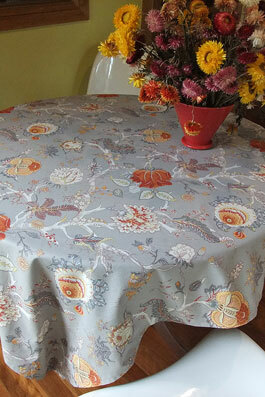 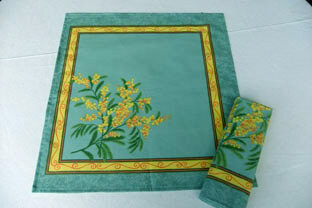 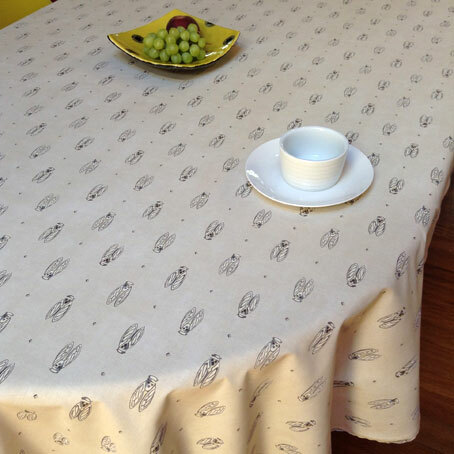 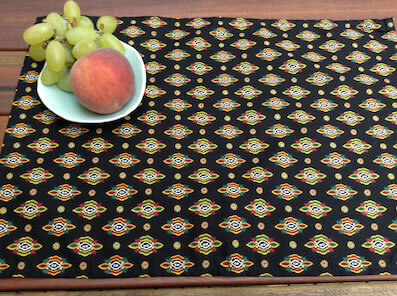 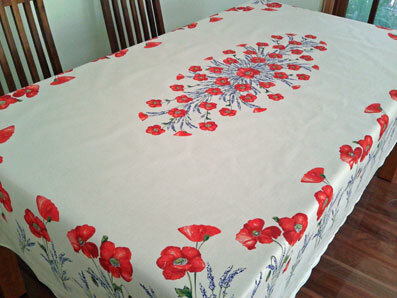 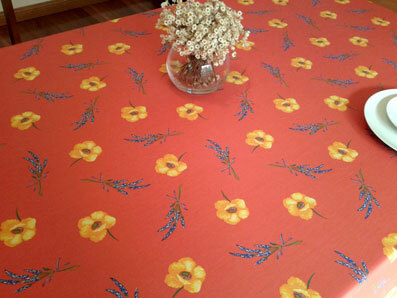 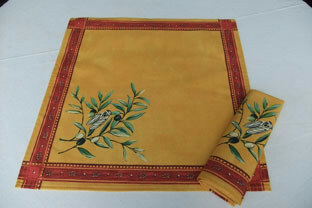 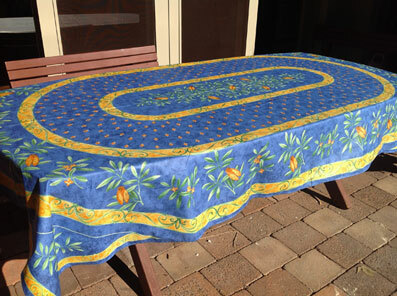 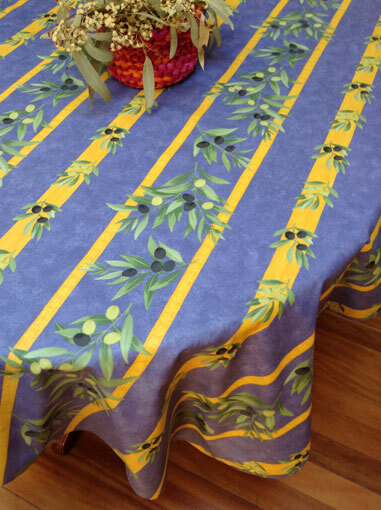 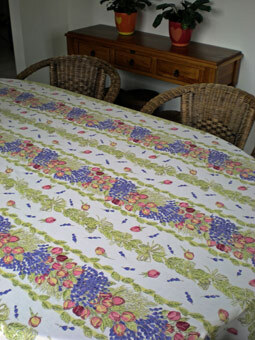 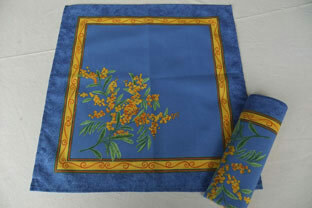 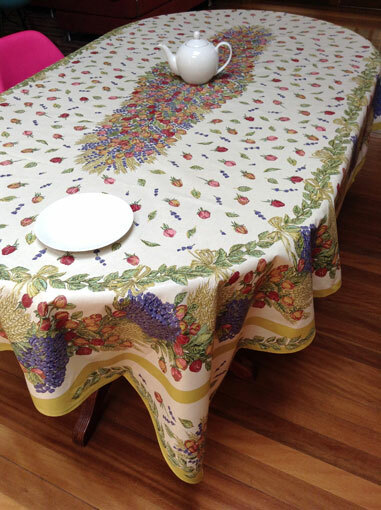 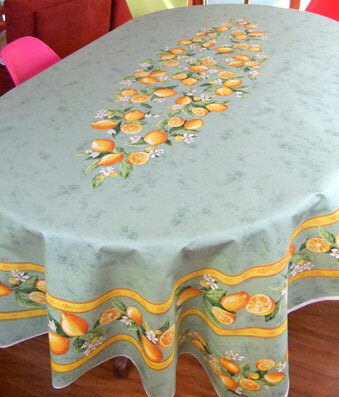 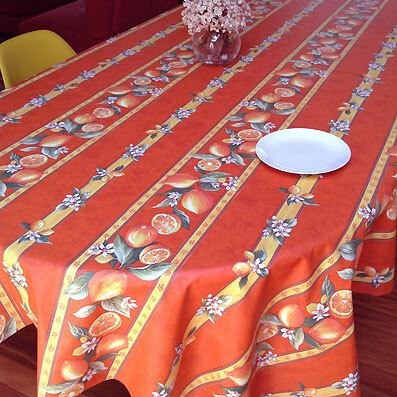 We can make very large or very small tablecloths in all our fabrics. 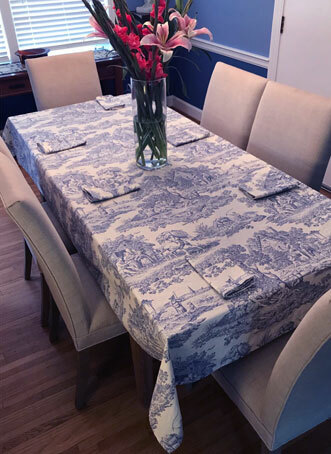 Just email the measurements of your table and we will send you an offer for a tablecloth to suit in the fabrics that you like. 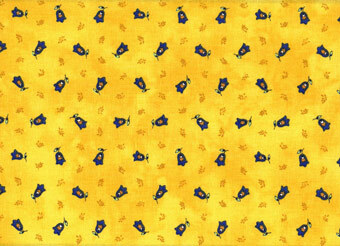 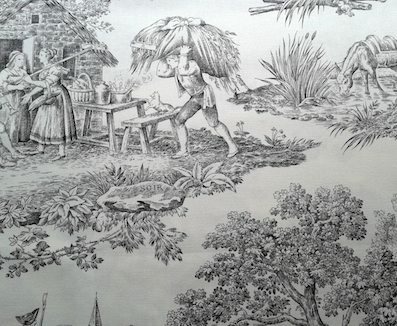 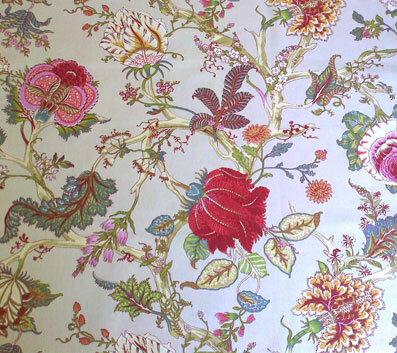 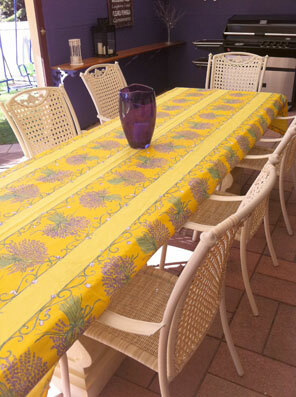 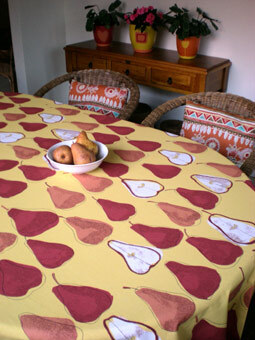 280 cm wide (110in wide) fabric with roosters and hens designs on a pale yellow background. 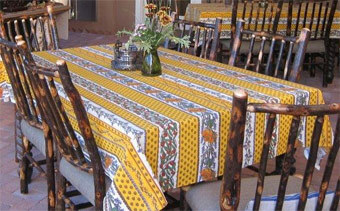 We can make very large tablecloths in this design. 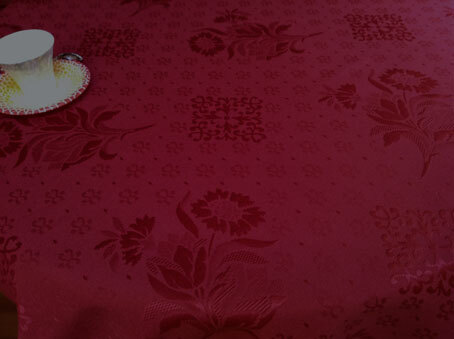 The fabric is thick enough for upholstery. 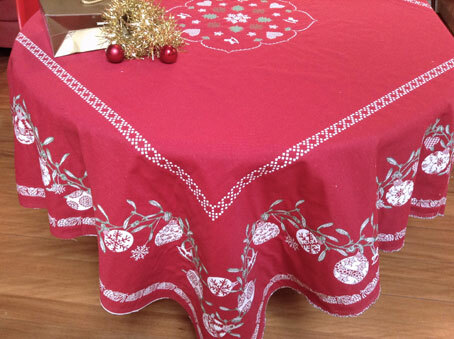 Ecru background thick woven fabric with silver thread, red Christmas decorations and green holy leaves gives this magnificient, double sided 10 to 12 seater Christmas tablecloth a true festive feel. 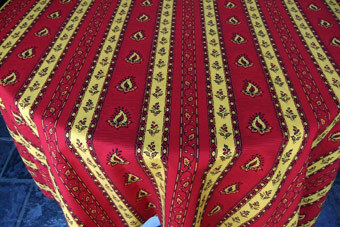 Very thick, reversible woven fabric. 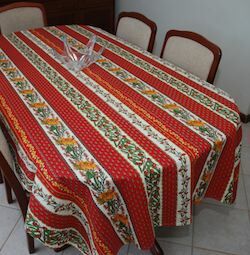 Reversible thick woven fabric with one side red (above) and one side ecru (below), an heirloom tablecloth to celebrate Christmas and the holy season. 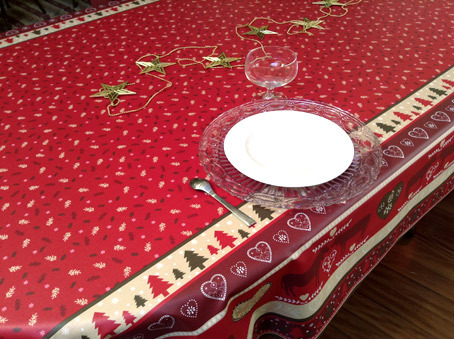 Beautiful thick woven fabrics with fir trees, Christmas baubles, snow flakes ... A truly luxury festive tablecloth to showcase your Christmas lunch and dinner. 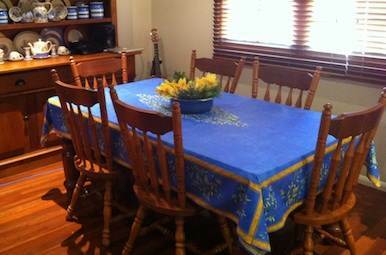 Email the dimensions of your table and we'll give you a quote. 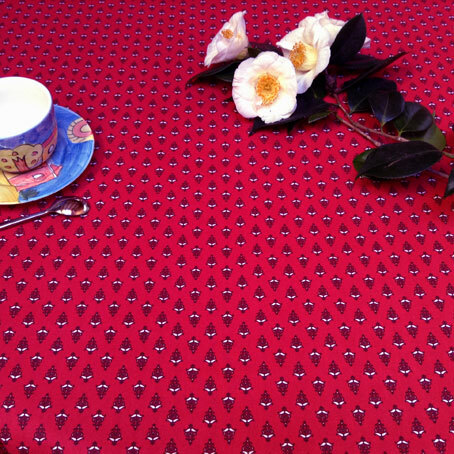 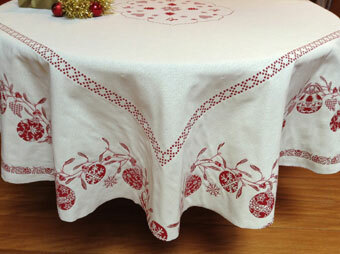 Christmas design heavy cotton tablecloth. 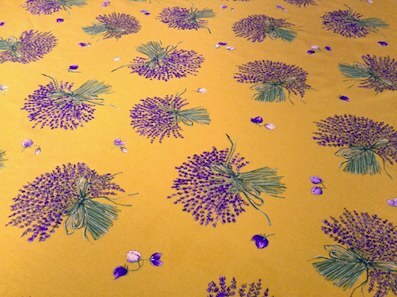 This fabric is 280 cm / 110 in wide. 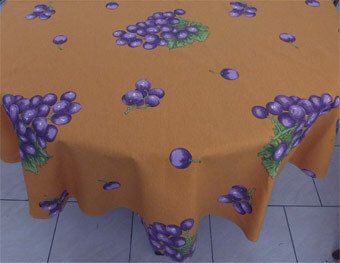 We can make very large round cloth with no seam in this fabric. 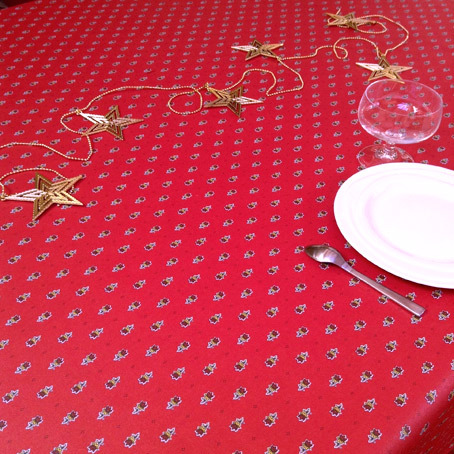 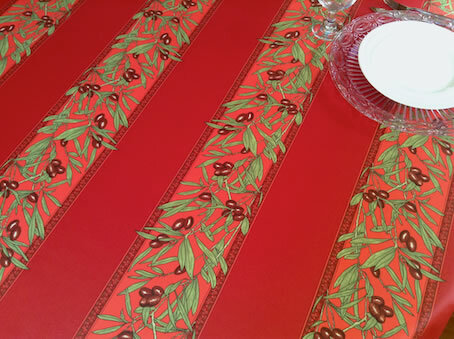 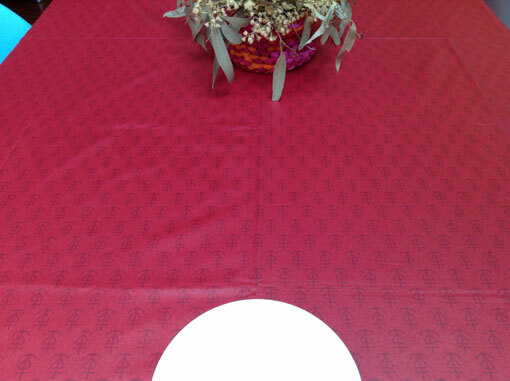 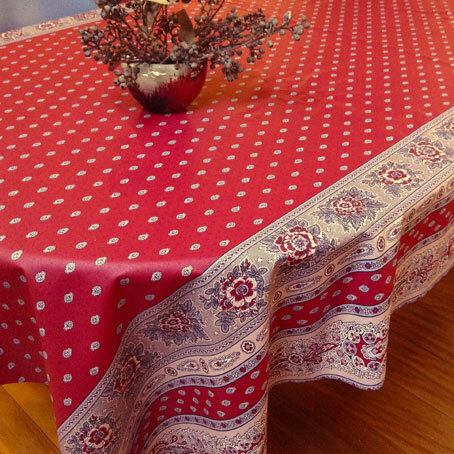 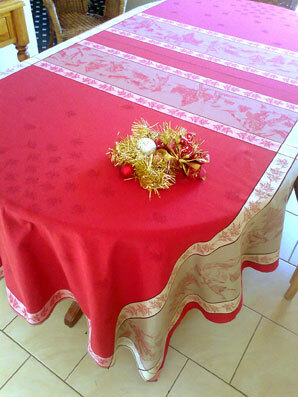 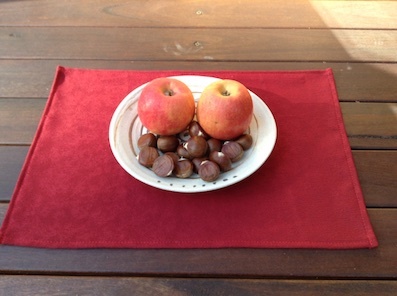 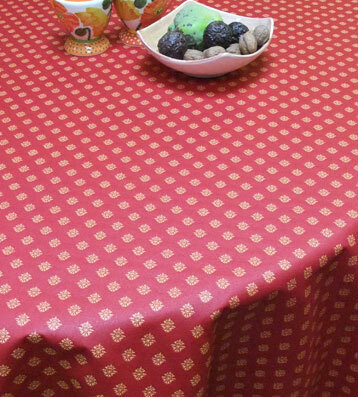 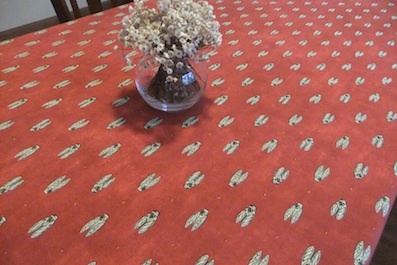 Dark red Christmas tablecloth with acrylic coating. 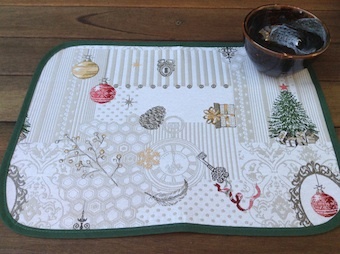 A border on both sides with snowflakes, hearts and reindeers. 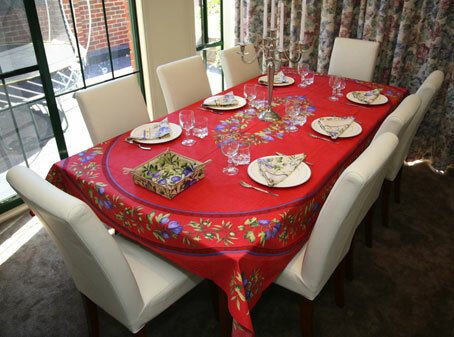 A wipe over the cloth at the end of the festivities will be all is needed before you store it in your linen cupboard for next year. 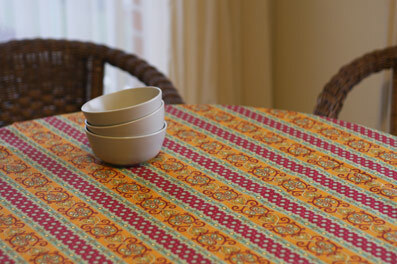 It can be made in any size to suit your family table with all the extensions ! 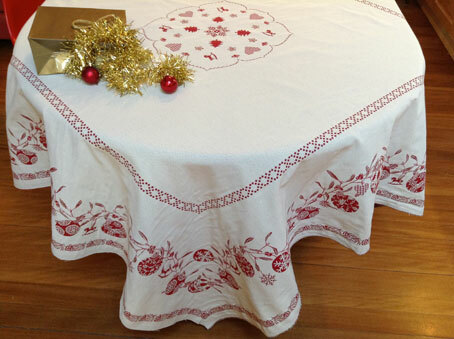 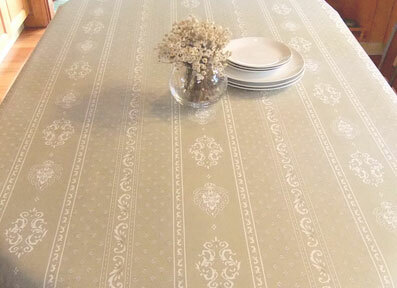 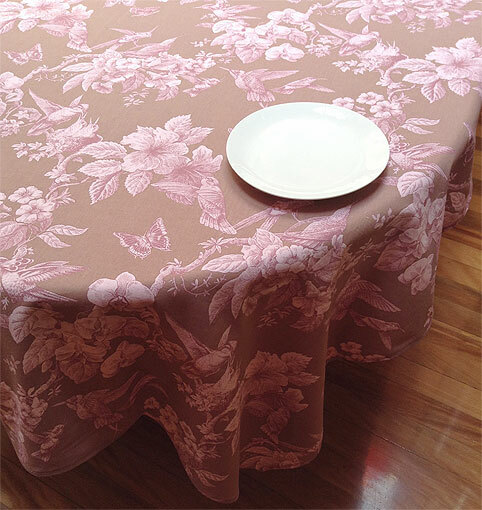 Beige and blush Christmas tablecloth with acrylic coating. 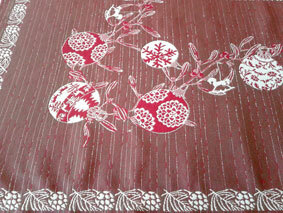 A border on both sides with snowflakes, hearts and reindeers. 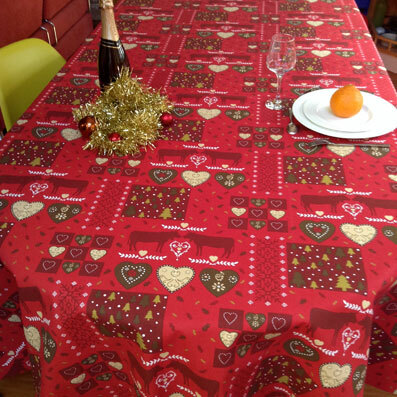 A wipe over of the cloth at the end of the festivities will be all is needed before you store it in your linen cupboard for next year. 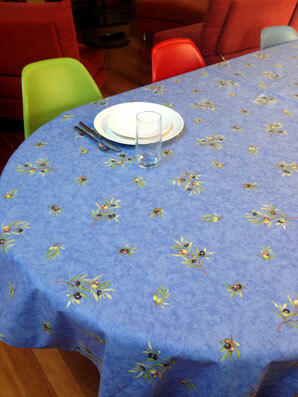 It can be made in any size to suit your family table with all the extensions ! 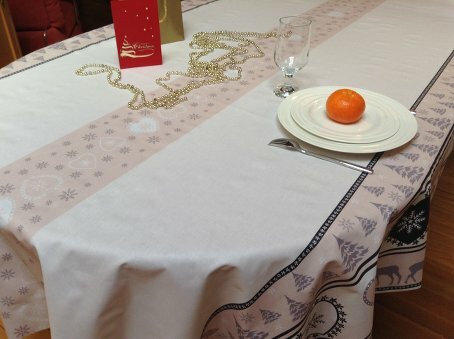 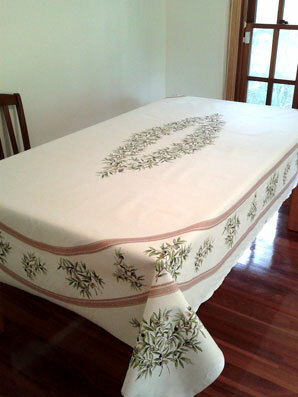 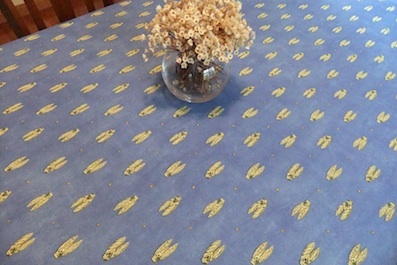 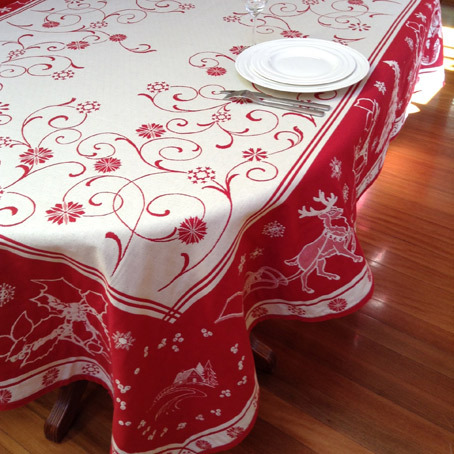 Christmas tablecloth with acrylic coating. 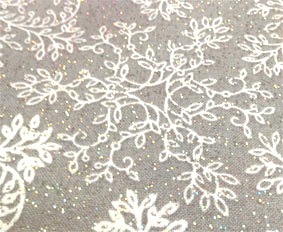 Red and gold snowflakes and stars on a white background. 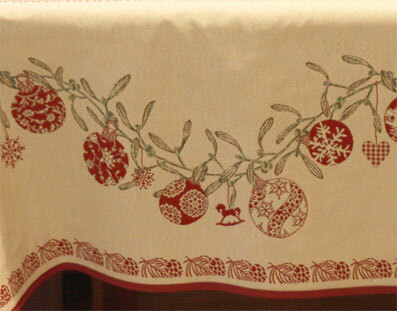 A wipe over the cloth at the end of the festivities will be all is needed before you store it in your linen cupboard for next year. 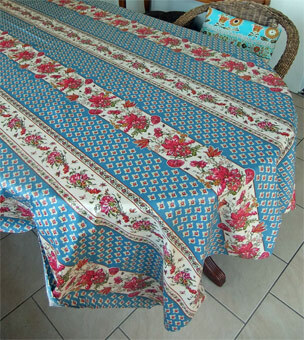 It can be made in any size to suit your family table with all the extensions ! 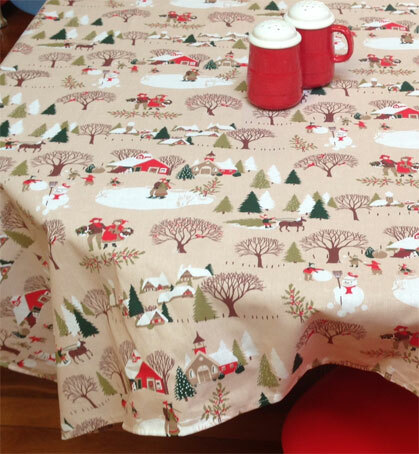 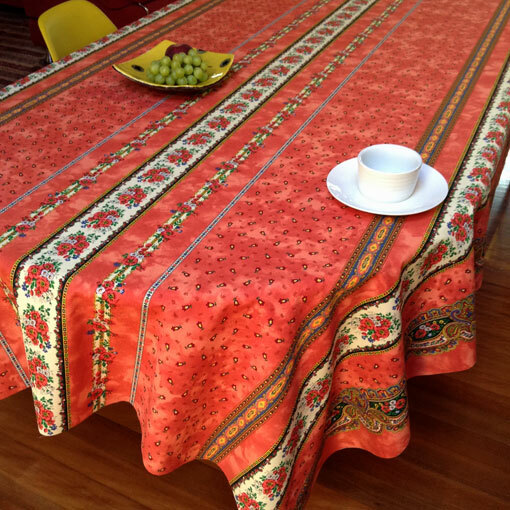 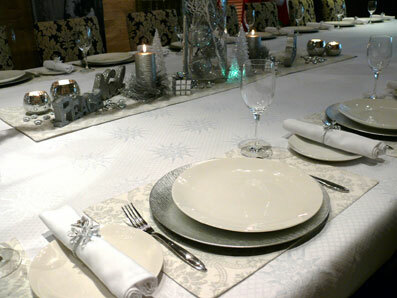 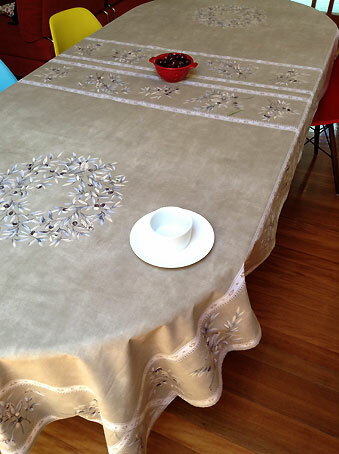 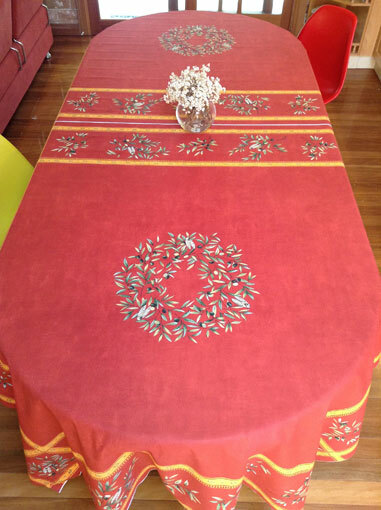 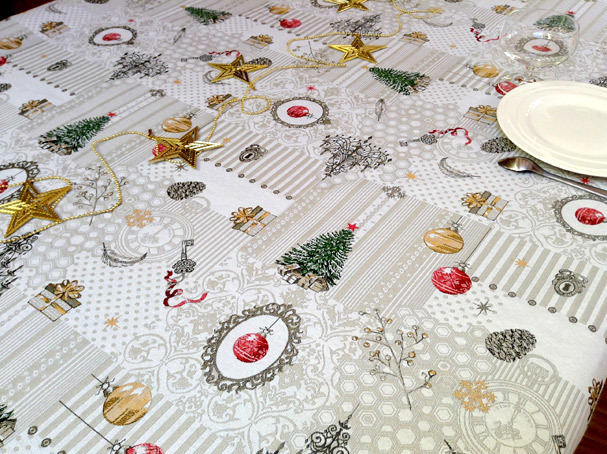 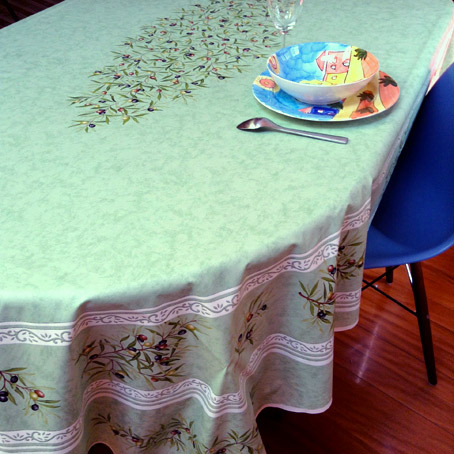 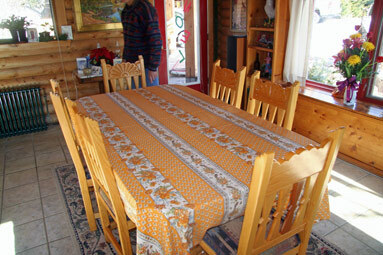 Winter and Christmas tablecloth with acrylic coating. 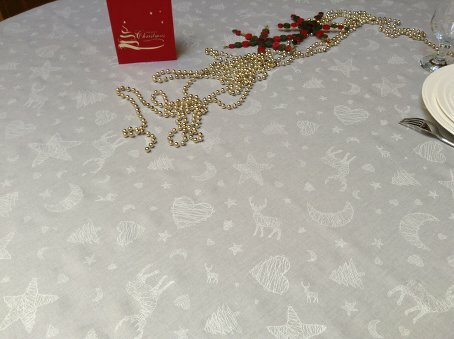 Stars, hearts and reindeers off-white designs on light grey background. 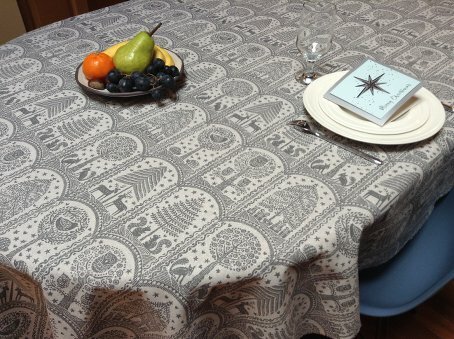 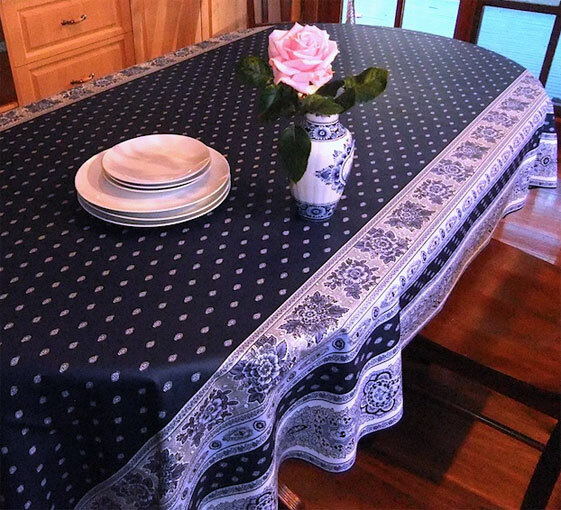 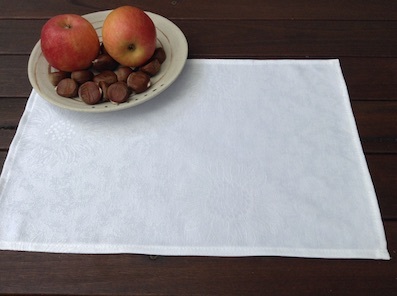 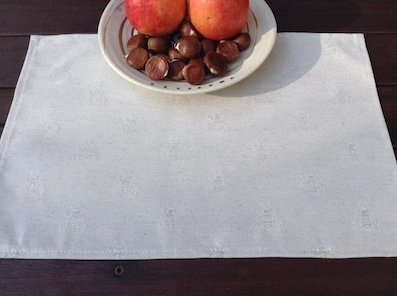 This is an easy care, wipe over French tablecloth which can be made in very large size to suit your family dining room table with all the extensions ! 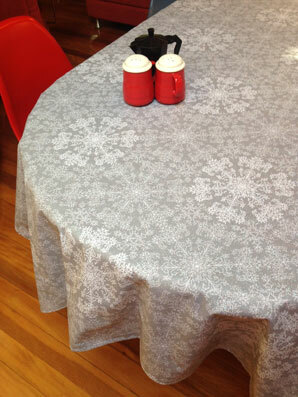 Winter and Christmas tablecloth with acrylic coating. 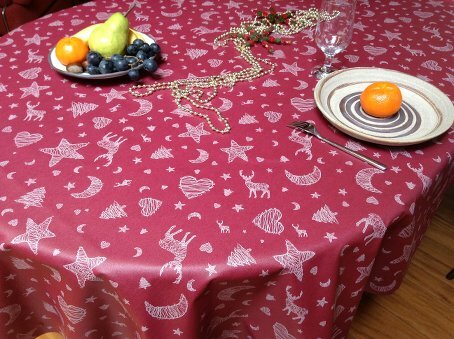 Stars, hearts and reindeers silver white designs on a dark red background. 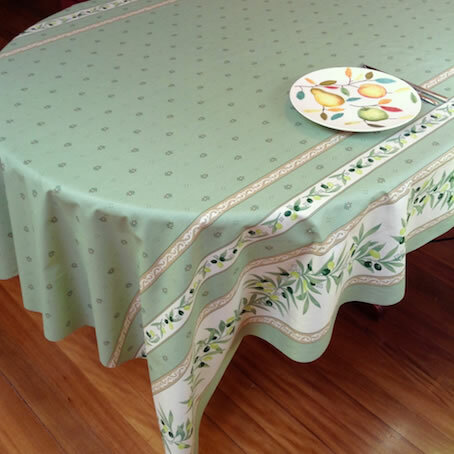 This is an easy care, wipe over French tablecloth which can be made in very large size to suit your family dining room table with all the extensions ! 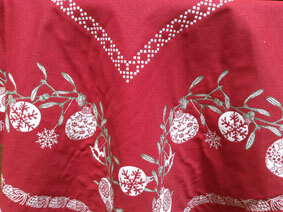 The centre of this cloth has a Christmas red background sprinkled with firtree twigs. 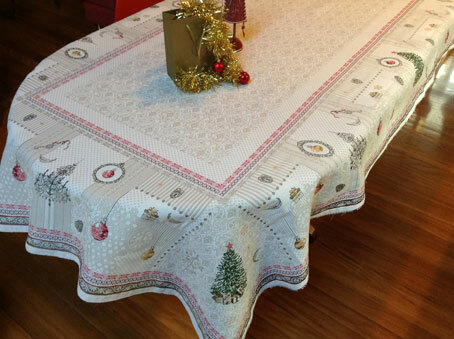 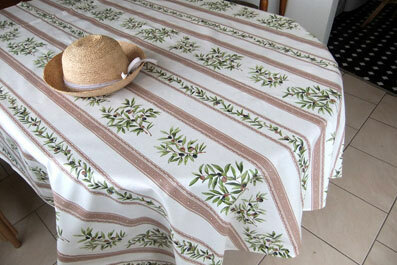 A border on both sides with Red and green fir trees, harts and friendly cows from the Alps give a "Christmas in the mountains" feel to this coated tablecloth which you will be able use time after time with very little maintenance. 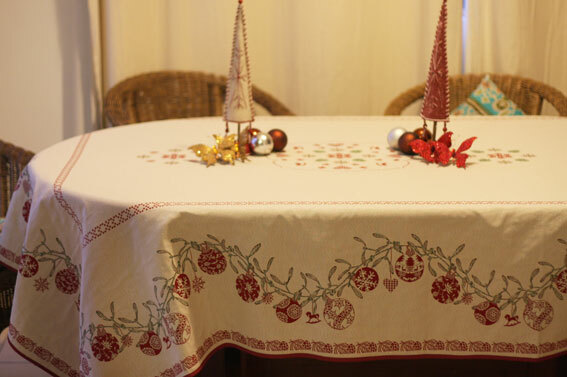 A wipe over of the cloth at the end of the festivities will be all is needed before you store it in your linen cupboard for next year. 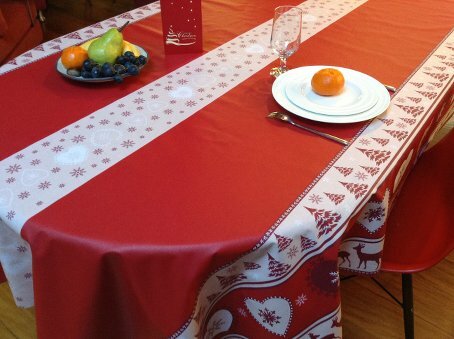 It can be made in any size to suit your family table with all the extensions ! 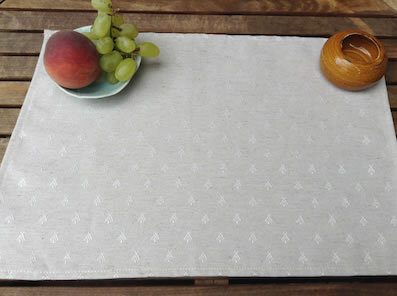 Christmas tablecloth with a nordic feel, Anastasia has beautiful ethnic designs in silver grey on an ecru background with silver sparkles ! 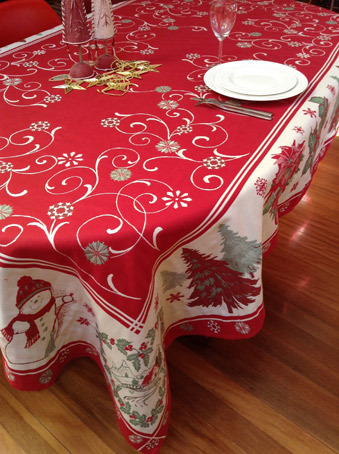 It is available in cotton or with acrylic coating for easy clean after the festivities. 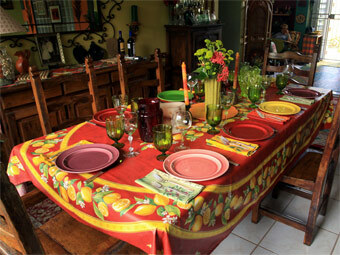 To add a Provencal touch to your Christmas table, Pauline red all-over has all the right colours ! 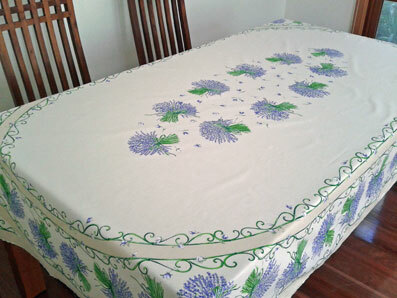 It is also acrylic coated for easy clean after the festivities. 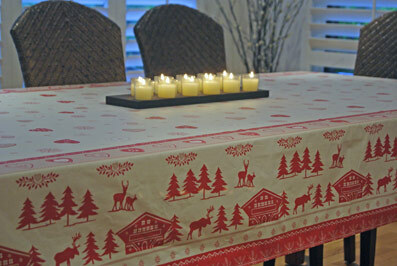 Chalets, reindeers and fir trees set the scene for a snowy Christmas with a touch of Scandinavia ! 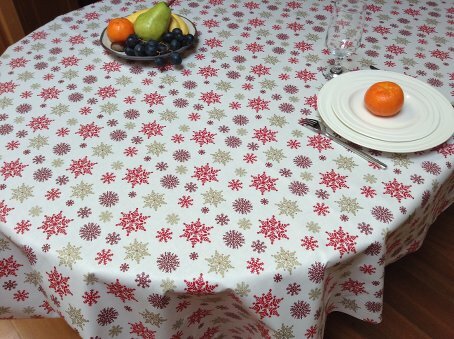 A linen colour background with sparkles for this elegant Christmas oilcloth. 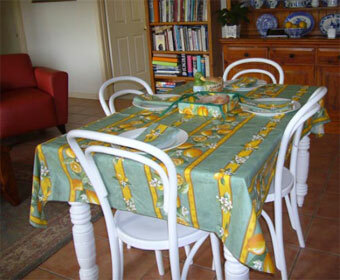 It is acrylic coated for easy clean after the festivities. 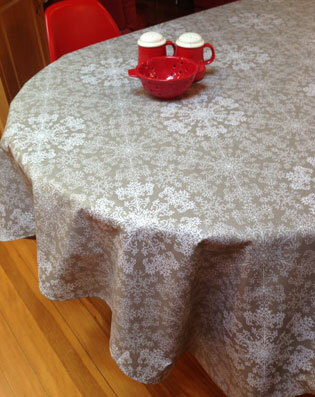 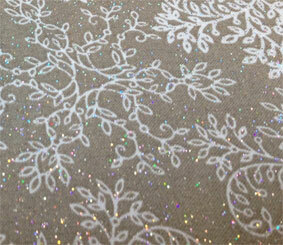 A mid-grey background with sparkles for this elegant Christmas oilcloth. 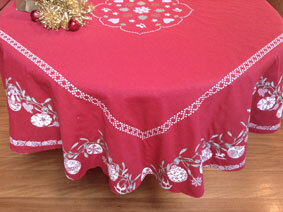 This festive cotton tablecloth will set the theme for all your Winter and Chirstmas entertainement. 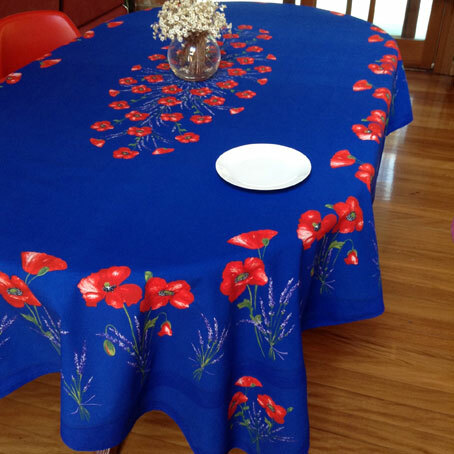 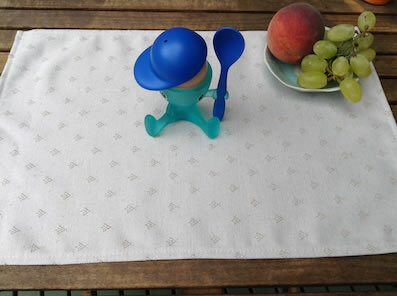 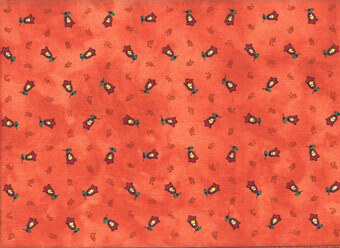 We can make very large or very small tablecloths in this design which is sure to please all the young ones! 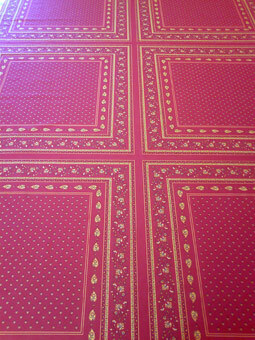 Versailles fabric is 330 cm / 130 in wide.